At KMH we have expertise in everything we sell. There is no substitute for quality, efficiency and safety. Working with KMH service teams and our OEMs (original equipment manufacturers) you are not just buying a part, you are investing in our over 40 years of experience and expertise to service your future. Staying on top of your fleet and team during the winter months prevents issues that can arise if your not cold-weather ready, such as leaks, dead batteries and cracked radiators. Companies that rely solely on reactive maintenance are essentially waiting for a problem to happen, and this can be a very costly move. Unplanned downtime can result in idle employees, halting the production line, missed deadline. Any unexpected failure of your equipment can mean having to pay technicians overtime and having to pay extra money for delivery of parts. 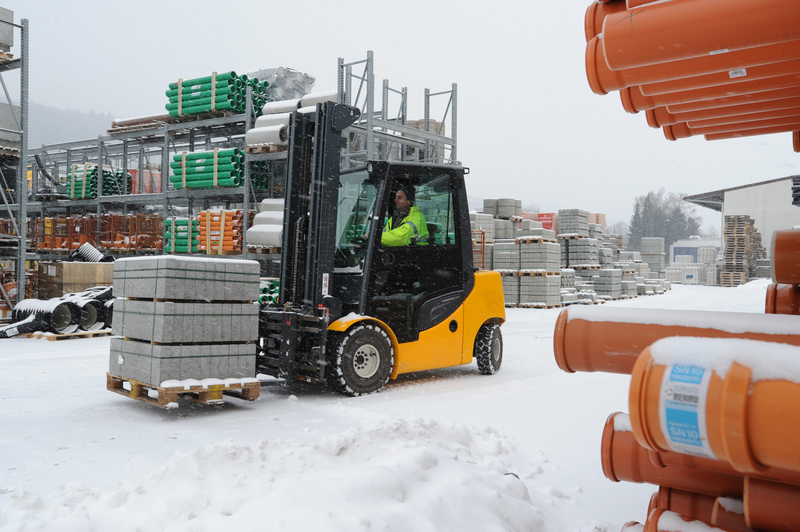 Is Your Forklift Fleet & Team Ready For Winter? Preparing your forklift for the winter months prevents issues that can arise by not properly getting your forklift cold-weather ready, such as leaks, dead batteries and cracked radiators. Our Service Department is prepared to give you all the help you need to maintain your fleet this year and beyond. You can save hundreds or even thousands of dollars of the cost of buying new equipment. While pricing varies by job, we can repair or rebuild your vehicle at a fraction of the cost of purchasing a new one. Refurbishment involves a thorough inspection of the unit and replacing or replacing all defective components, essentially bringing the machine back up to speed so it works as hard as a new machine. Typically, a refurbishment will address every component of a machine: everything from cosmetics and operator comforts to mechanical and electrical components. The goal is to help the customer by producing equipment that is as close to the original as possible. 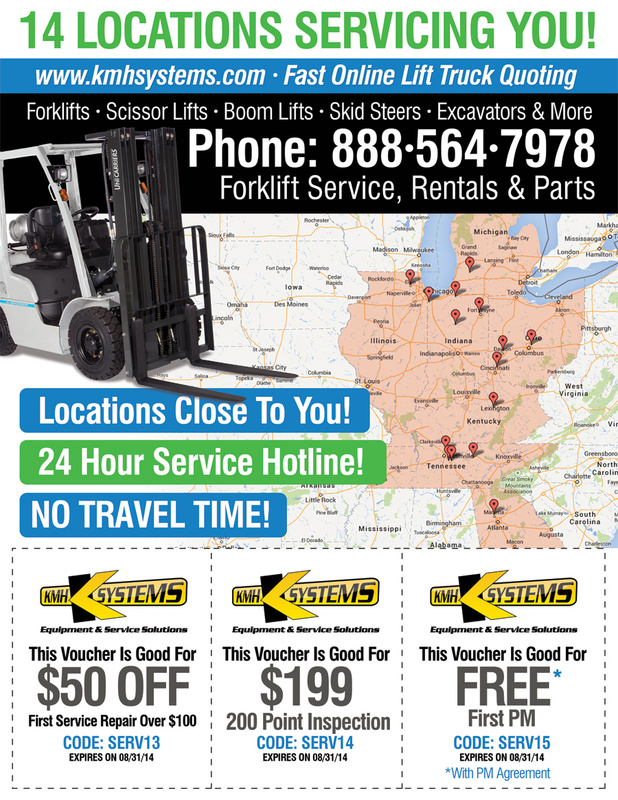 Over time, all machines break down and need repairs, but remember good used forklifts work every bit as well as new ones do and at a much lower price without sacrificing quality or choice. Refurbishment, if done at the right time, on the right equipment, and by the right people, can provide significant cost savings when compared to buying new. Being able to have more than one operational forklift allows the user to alternate forklifts, which puts less wear on the machines, extending their life and your budget. Increased productivity increases the amount of work that can be done over the same period of time. More productivity means you are investing less and benefiting more. 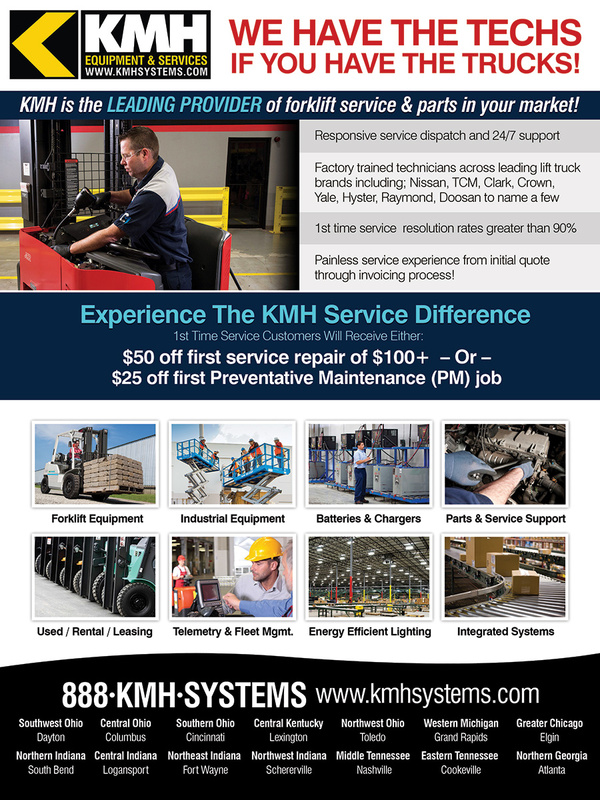 Let the KMH Parts & Service Team give you a FREE QUOTE to completely recondition your aging material handling equipment instead of buying new. In many cases we can fully recondition two for what you can expect to pay for one new one. It’s a fact that bad maintenance can have a serious effect on the health of a company and its employees. Not only will poor maintenance habits put the lives of the people who work on the equipment at risk, it will also affect the financial health of the business. In order for a company to be competitive they must follow sound vehicle and equipment maintenance procedures. Planned Maintenance programs, if done on a regular basis, will significantly extend the life of the vehicle. This will include such things as changing of oil and filters; cleaning and lubrication; checking of all fluid levels; inspections for fork wear or chain stretch, vehicle inspection; and operational checks. One of the best ways to reduce costs and maintain your material handling equipment is to have a planned maintenance program in place. Planned maintenance is an agreement to have a dealership service your forklifts on a regular basis. You may set up the frequency of maintenance based on preference and how much the equipment is used. Here are several reasons why planned maintenance will save your company time and money. Every service includes a multi-point safety and operations inspection to ensure the unit is not posing any potentially harmful threats to its operator. This inspection helps catch issues before they become a major safety concern or major repair. Regular maintenance will reduce the frequency and severity of repairs. Without proper maintenance, it is possible that your equipment could have more frequent problems, such as pump repairs and engine rebuilds. Equipment that is well maintained does not break down. This improves productivity as well as your profits. Repairs are made on a “fix-before-fail” basis, minimizing cost and residual damage. You will have an experienced technician at your location each time your unit is due for service. You won’t have to be concerned with the possibility of an inexperienced tech performing checks on the unit and you will be able to plan service in advance when the unit will not be in demand. A trained technician will have the proper skills and tools to work on your equipment. This will result in less down time for you. Every PM procedure includes comprehensive multi-point safety and operations inspection to help spot the problems before they happen, leading to reduced downtime for your lift truck fleet. When you have a regular PM program you will begin to see benefits very quickly. Not only will a sound maintenance program increase reliability and safety, it will also reduce downtime, contribute to profits, and enhance the competitiveness of your business in the marketplace. WE HAVE THE TECH IF YOU HAVE THE TRUCKS! KMH is the LEADING PROVIDER of forklift service & parts in your market! Painless service experience from initial quote through invoicing process!